Johnson later moved to his farmhouse in 1971, and the collection grew to fit the added space during several renovations to his home. The final tally was 330 pieces in total—300 of which Johnson recently donated to the Rochester Institute of Technology Archive Collections. Following his apprenticeship, Wildenhain opened workshops in Putten, Holland, then Amsterdam, where he also taught at the School for Applied Arts. He came to the U.S. in 1947 to the Pond Farm Workshop in Gureneville, Calif., before joining RIT’s School for American Crafts in 1950 where, along with Hobart Cowles, he helped create the legendary ceramics program. Johnson’s life equally took some interesting twists and turns. He graduated from Rensselaer Polytechnic Institute in Troy, came to Rochester in 1954, and while employed at Eastman Kodak, voraciously studied piano at Eastman School of Music. “But my Kodak earnings were higher than those of a musician, so I ended up working at the company as a development supervisor until I retired 30 years later,” Johnson says. “By then I was bitten by the collector’s disease; I couldn’t stop buying Wildenhain’s pots. Unlike most collectors, Johnson never kept formal records or receipts for his Wildenhain purchases. He simply bought what he liked, when he liked. 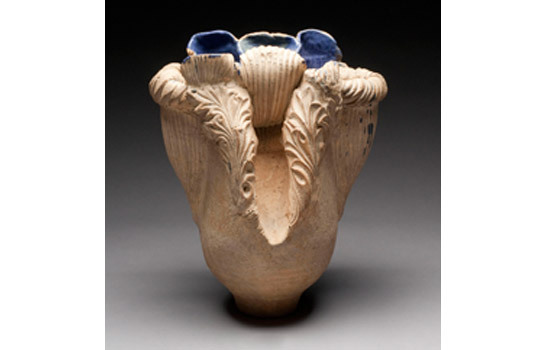 “Perfection is dull and what I treasured about Wildenhain’s pottery were the irregularities—how his fingers could mold clay into something that lives and breathes life,” Johnson says. “I never got tired of looking at them, and to me that was a priceless gift. Note: Joint exhibitions of the collection are planned for Fall 2012 at RIT’s Bevier Gallery and Dyer Arts Center at the National Technical Institute for the Deaf.